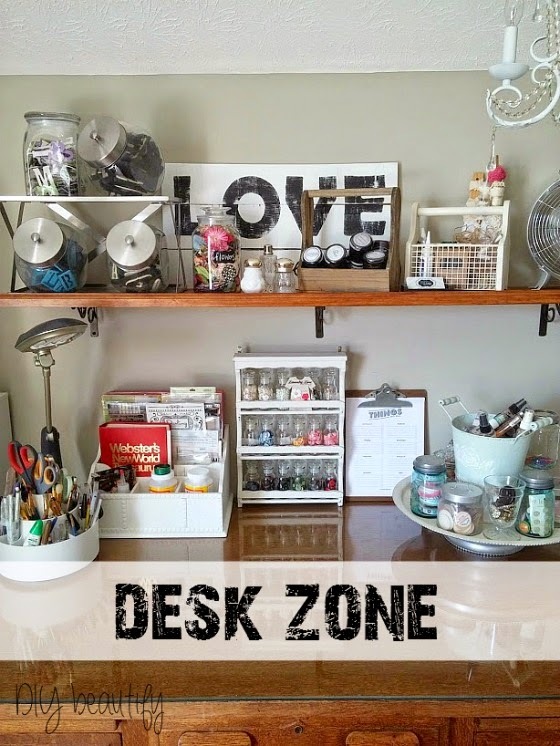 Lately I have been feeling completely overwhelmed by all my 'stuff' and desiring a calmer, clutter-free space. I have begun the de-cluttering process around my home. One of the first places I focused on was the space where I create. Because we don't have an extra room where I can have a dedicated craft space, I am using a wall in our bonus room. This is the room where we watch tv, hang out, use the computer, exercise....and where I craft. It's definitely a multi-purpose room and so I need to try to keep my area clean and clutter-free. 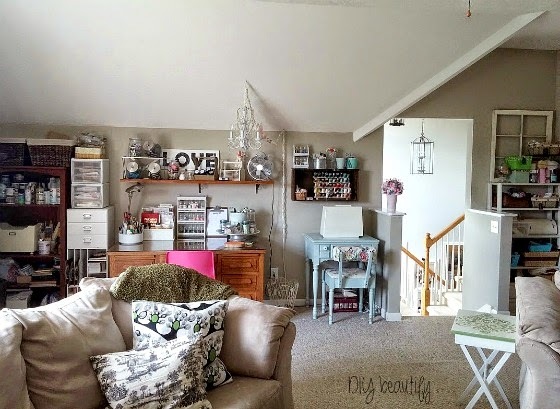 You can see how any clutter and mess can make this room look and feel chaotic! 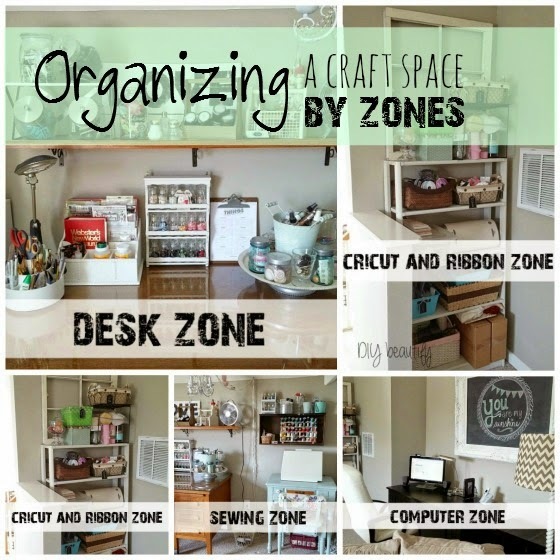 I found that having specific zones helps me be better organized and more efficient because I know where to find things, and where to put them away. Here is a breakdown of my zones. 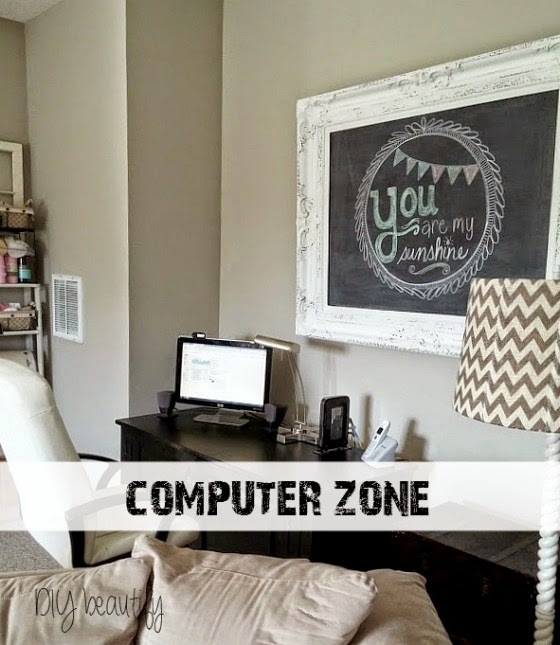 Starting on the far right of the space is the Computer Zone. I removed all the clutter from the wall and brought in my giant yard sale frame-turned-chalkboard from downstairs. I love how it fills the nook and creates a focal point. My burlap covered lamp sheds light on the computer area. Next is my Cricut and Ribbon Zone. This is where I store all my cartridges, cutting mats, vinyl etc for my Cricut Diecut Machine, as well as the machine itself. I'm also storing some of my ribbons, trims and embellishments in baskets. I hung chalkboard tags on the baskets with the name of the contents to make it easy to quickly find what I need. What's new here is I added the antique window frame (that was hanging above the computer) and just leaned it against the wall. It adds oomph to the smallish bookcase and makes it look more substantial in the space. I found the bookcase in my neighbors trash last year, and it was the perfect size to fit this narrow space. I painted it to match the wall so it would blend in. Love freebies like that! Next up, on the other side of the open stairway, is my Sewing Zone. I didn't change much here, although I removed clutter from the shelf that holds my threads and added some painted tins that nicely conceal sewing supplies. Beside this is my Desk Zone. Previously, the shelf above the desk extended all the way to the wall on the left. I had Mr DIY cut the shelf down so now it's the length of the desk. I like the way it looks better now and rather than just stuffing it with supplies, I took time to "stage" it so it looks more attractive while still being functional. I added my handmade Love never fails sign and even had room at the end for my little vintage fan. 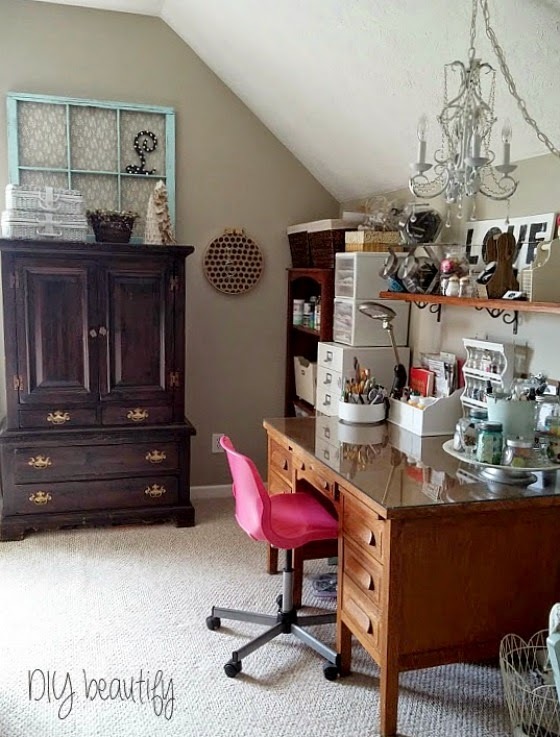 The small chandelier was a thrift store find several years ago and I love how it adds a feminine touch to my desk area. It's also a powerful illuminator! Moving along to my Paint Zone, this is where the biggest change took place. This area used to be a mess. All my paints were piled haphazardly in baskets and were sitting on an old nightstand. It was clutter-central! You can see what it used to look like here. By cutting the shelf above my desk down, I had room to add a narrow tall bookcase. 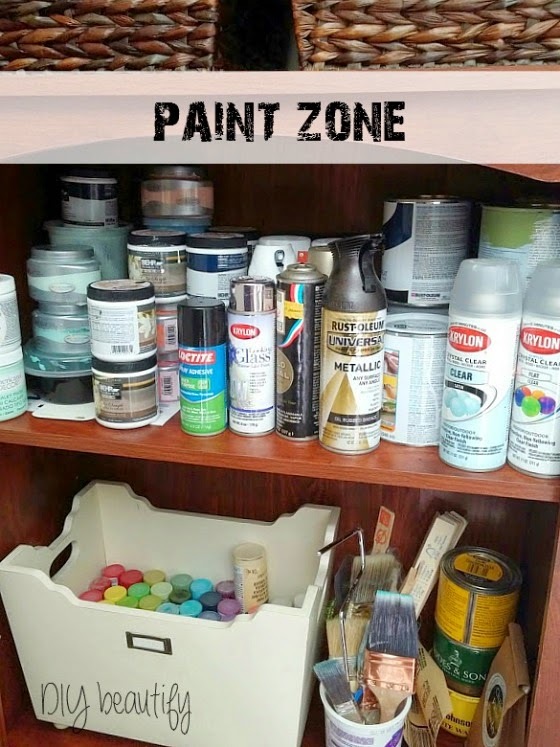 The shelves are fantastic for organizing all my paints and painting supplies like brushes, rags, waxes, etc. I've got my paints organized by color so it's easy to find what I want. The baskets are now on top of the bookcase and hold extra craft supplies that used to crowd up the shelf above my desk. They are now invisible inside the big baskets. This solution also freed up the wall for a cute little DIY hanging. 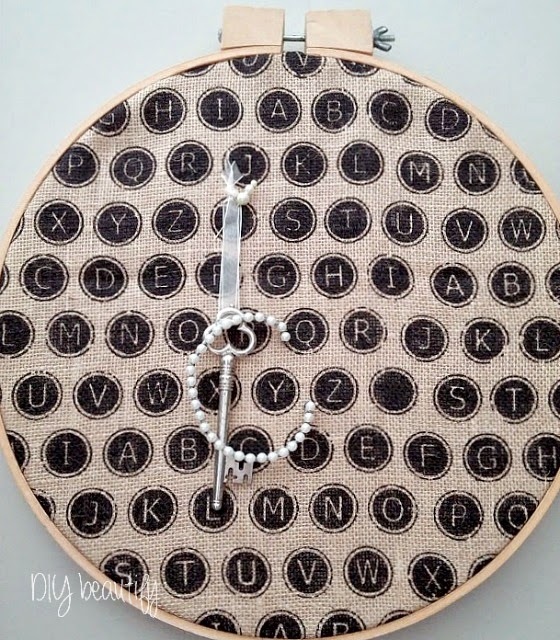 It's just an embroidery hoop with burlap. I can easily pin inspiration pictures or quotes to the burlap. I'm liking how clean it looks right now though, with just the key and my pearl initial, and may just leave it this way! I know I'll be able to be a more efficient crafter now that I can easily find everything and put things away where they belong. 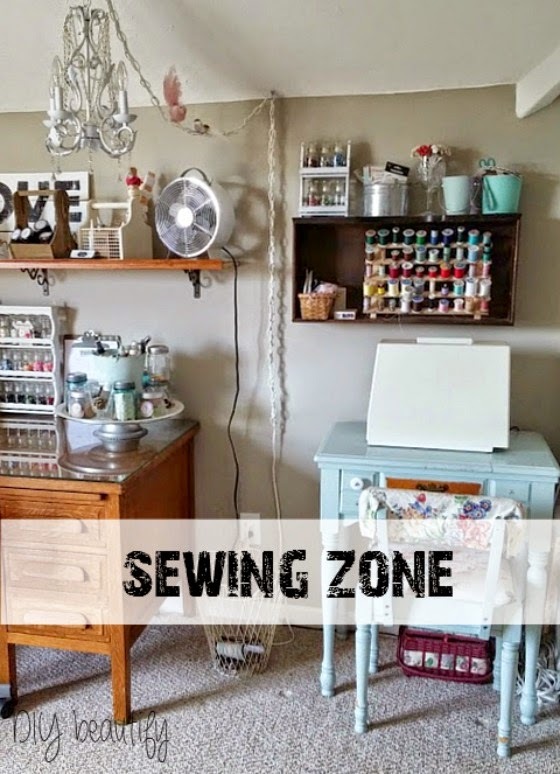 If you're struggling with overwhelming clutter in your craft area, I encourage you to get rid of what you don't use, and think in terms of 'zones' as you reorganize. It will make your space much more user-friendly! 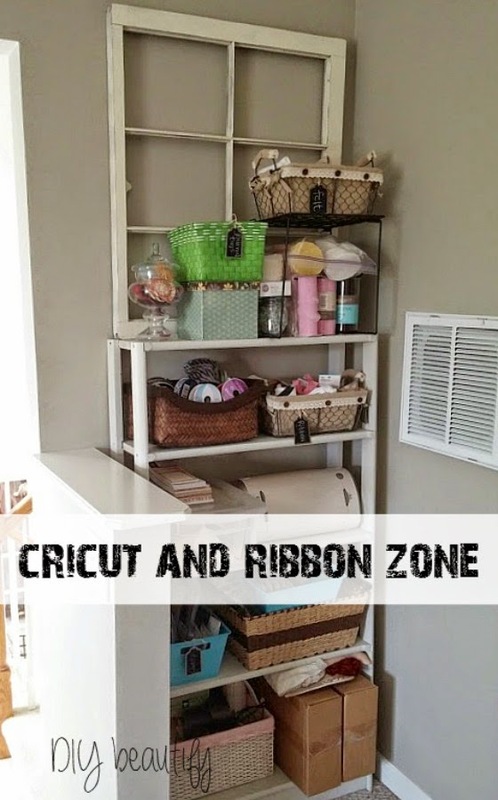 Utilize baskets, jars and other storage that is pleasing to the eye (and corrals the clutter). And...because I think you're awesome, here is a link to get free shipping when you shop at Cricut.com. Use your machine to create labels for your bins and baskets and organize your space! And I sourced some chalkboard tags for you if you're serious about reigning in your clutter with labels but don't own a Cricut. Cindy, that is such a good idea to do zones. I don't have a separate space for my crafting either, so I have all my stuff in our guest room. I've struggled with wanting a nice guest room and needing it for my crafting too. Your idea of zones along with cute little decorations might be the answer for me. Organized chaos can be cute, right? Ooo, now that I know what I'm going to do I can't wait to get started as soon as our family moves out (DD and her fam are remodeling a foreclosure). What a beautiful and organized work space! You must love it!